Intra-abdominal complications after open-heart surgery are infrequent (0.3%-2.0%). However, the mortality rate of patients exposed to these complications is extremely high (11%-59%). , In this case report, the patient happened to have intra- and post-operative iatrogenic liver injuries by chest tubes, associated with intra-abdominal hemorrhage after CABG. Various causes of post operative hemodynamic instability were investigated promptly, managed aggressively, and led to successful outcome. A fifty-seven-year-old man with history of smoking, coronary artery disease (CAD), diabetes, hypertension, and hyperlipedemia, was admitted with inferior ST segment elevation myocardial infarction (STEMI). He had history of previous anterior myocardial infarction (MI) and percutaneous coronary intervention (PCI) to the left anterior descending (LAD) coronary artery. ECG and cardiac enzymes confirmed the diagnosis of MI. Full blood count; electrolytes and coagulation studies were within normal values. Thrombolytic therapy was given, and the patient was started on Clopidogrel. Echocardiography showed hyopkinetic posterior segment, with left ventricular ejection fraction (EF) of 55% and right ventricular systolic pressure (RVSP) of 32 mmHg. Coronary angiography showed in-stent occlusion of the LAD, 90% stenosis of ramus marginalis and 90% lesion of the right coronary artery (RCA). Ten days after thrombolytic therapy, and 3 days after stopping Clopidogrel, the patient underwent urgent CABG operation using the left internal mammary artery (LIMA) to LAD and vein grafts to RCA and ramus marginalis. The aortic cross-clamp time was 61 minutes, and total cardiopulmonary bypass (CPB) time was 108 minutes. Two anterior chest tubes were placed; one in the anterior mediastinum and the second in the basal area of the left pleural cavity. Both pleural spaces were left open during the operation. Intra-operative blood products were administered (6 units of platelets, 4 units fresh frozen plasma (FFP) and 4 units of cryoprecipitate). At the end of the procedure, the patient was transferred to the surgical intensive care unit (SICU). The immediate post-operative period was characterized by bleeding, with a total blood loss of 1,400 ml in 16 hours. Coagulation studies abnormalities were corrected using FFP, platelets and PRBC's. The bleeding was controlled. The patient remained hemodynamicaly stable. Sedation was discontinued on the following day, and the patient was extubated. 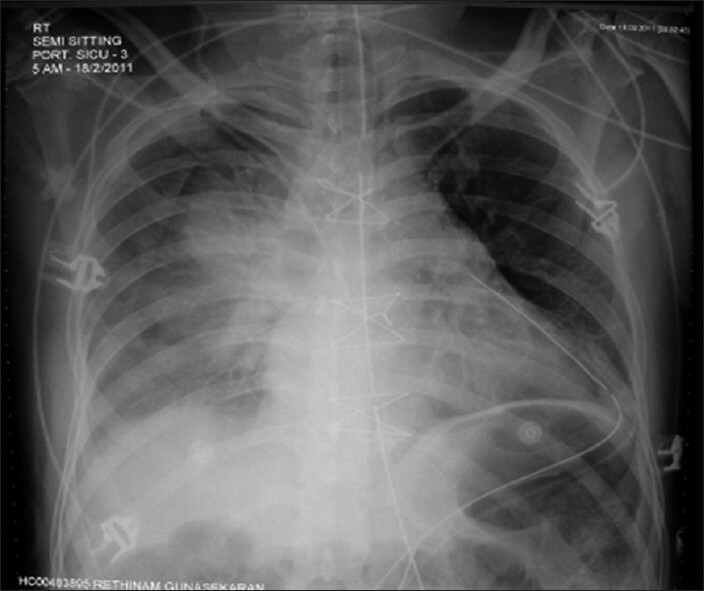 The early morning routine chest X-ray showed right pleural effusion, and left and mediastinal chest drains in good position [Figure 1]. He was hemodynamicaly stable, and inotropic support was weaned off. 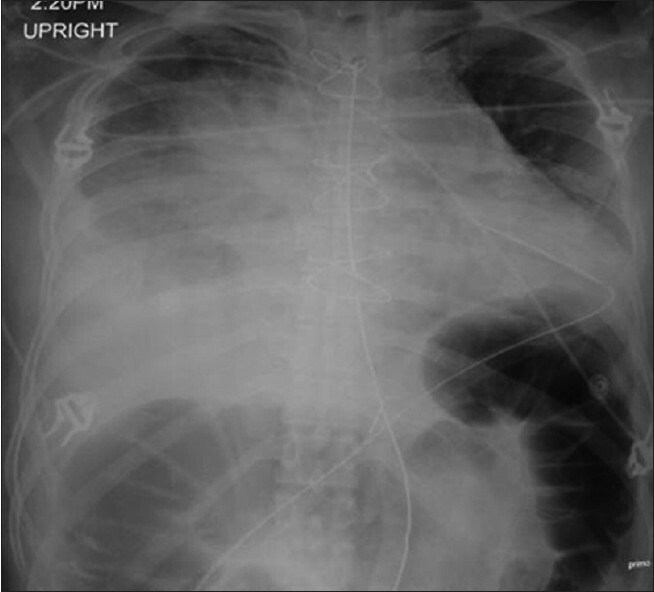 Figure 1: Chest X-ray on the first postoperative day showing right pleural effusion with mediastinal and left drains in place. By the early afternoon of the first post-operative day, O 2 saturation (SpO 2 ) dropped to 91%, and the abdomen was distended. A repeat chest X-ray showed increased haziness on the right side of the chest, distended stomach, and colonic loops with elevated right hemi-diaphragm [Figure 2]. Figure 2: Chest X-ray on in the afternoon of the first postoperative day showing increase in the amount of effusion with gastric distension. A right intercostal drain was inserted in the 8 th intercostal space without difficulty, and drained a total of 800 ml of dark blood. Chest X-ray showed very low position of the new right intercostal drain, with resolution of the pleural effusion and clinical improvement of the SpO 2 to 98% [Figure 3]. 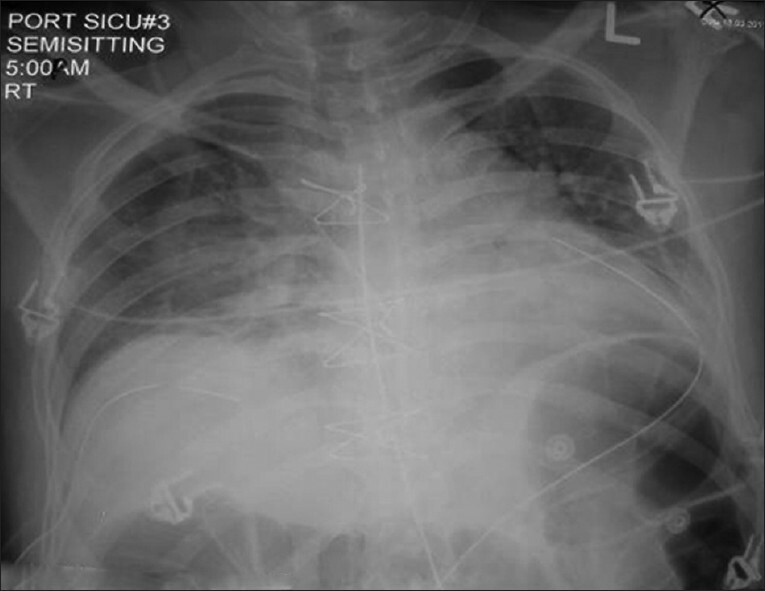 Figure 3: Chest X-ray following insertion of right chest drain. Very low insertion of this chest tube is noted. Two hours later, the patient became distressed, hypoxemic, and hypotensive with signs of hypovolemic shock, severe metabolic acidosis and drop of hemoglobin from 9.5 to 5.6 gm/dl. Aggressive fluid resuscitation by colloids infusion and blood products was administered, and inotropic support was re-started. He was electively sedated, intubated, and mechanically ventilated. Echocardiography showed normal EF, no evidence of tamponade, no segmental cardiac wall motion abnormalities and under-filling of the cardiac chambers. Abdominal ultrasonography showed a large supra-hepatic fluid collection and free intra-abdominal fluid. Computed tomography (CT) scan of the abdomen showed a large anterior hepatic subcapsular hematoma with active arterial and venous bleeding, a significant right subphrenic hematoma and free abdominal fluid [Figure 4]. 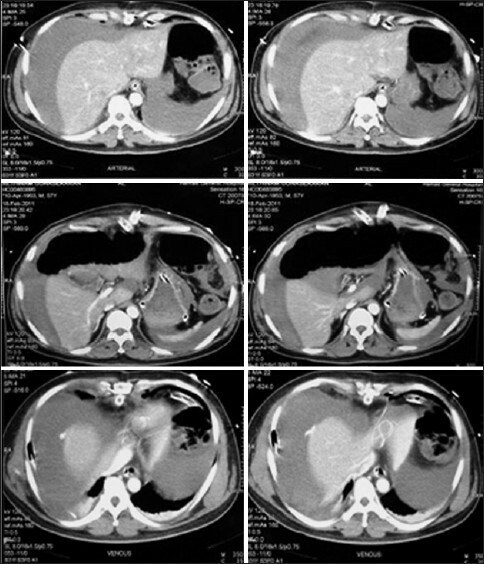 Figure 4: CT scan of the abdomen showing large anterior hepatic subcapsular hematoma, right subphrenic hematoma and some free abdominal fluid. Emergency exploratory laparotomy revealed 2,500 ml of free blood with clots, and two liver tears with active bleeding; one at the superior aspect of the right lobe of the liver, and the second at the anterior surface of the left hepatic lobe, with a small superficial serosal tear of the transverse colon. The anterior hepatic laceration corresponded with the intra-operative anterior chest tube placement, while the superior laceration was related with the post-operative right intercostal chest tube insertion. The bleeding points were controlled by gauze packing, the abdomen was closed, and the patient was transferred back to the SICU. Upon re-exploration after 48 hrs, the packs were removed. A small 3 cm superficial tear on the anterior surface of the left hepatic lobe, and a second puncture deep but small tear on the right lateral superior surface of the liver were identified along with a small superficial serosal tear of the transverse colon. The bleeding was controlled with Argon laser and absorbable hemostatic gauze (Surgicel® ). A single J-Vac® drain was inserted. The patient was transferred back to SICU with stable hemodynamics. Parenteral nutrition was started as the patient developed ileus. However, enteral feeding was given later on, and the patient was extubated on the 10 th post operative day. He was transferred to the ward, and remained hemodynamicaly stable. The J-Vac® drain output contained bile drainage that gradually decreased, eventually stopped, and the drain was removed. The patient made a full recovery and was discharged home after 23 days of hospital stay. Although gastrointestinal and intra-abdominal complications are rare after open-heart surgery, they significantly increase the mortality rate. The most common gastrointestinal complications in published large series were abdominal abscess, ileus, gastrointestinal ulcer (perforation/bleeding), enteric ischemia, and bleeding diverticulitis in the colon. ,,,,, Erkan and colleagues  reported one case of aortic valve replacement complicated with hepatic and splenic injuries. The patient expired after 28 days postoperatively due to abdominal bleeding that may have resulted from either the effect of low molecular weight heparin (LMWH), or due to blunt-trauma of the drainage tubes on intra-abdominal organs. The most common risk factors for GI complications after cardiac surgery include: age greater than 70 years, low cardiac output, peripheral vascular disease, redo operations, chronic renal insufficiency, increased number of blood transfusions, prolonged cardiopulmonary bypass time, arrhythmias, and the use of IABP. Our patient had some of these risk factors. However, these factors may predispose patients to enteric ischemia or ulceration, but not to injury of the liver. In our case report, the cause of bleeding was inadvertently caused by the insertion of the chest tubes. The first, intra-operatively through the anterior abdominal wall that resulted in the anterior left lobe injury of the liver and probably the serosal tear of the transverse colon, and the second by too low insertion of the intercostal chest tube, that was done in SICU for drainage of the right pleural effusion, which inadvertently caused the puncture injury of the superior aspect of the right lobe of the liver. To the best of our knowledge, this is probably the first case report of iatrogenic liver injury after open-heart operation. 1. D'Ancona G, Baillot R, Poirier B, Dagenais F, de Ibarra JI, Bauset R, et al. Determinants of gastrointestinal complications in cardiac surgery. Tex Heart Inst J 2003;30:280-5. 2. Zacharias A, Schwann TA, Parenteau GL, Riordan CJ, Durham SJ, Engoren M, et al. Predictors of gastrointestinal complications in cardiac surgery. Tex Heart Inst J 2000;27:93-9. 3. Christenson JT, Schmuziger M, Maurice J, Simonet F, Velebit V. Gastrointestinal complications after coronary artery bypass grafting. J Thorac Cardiovasc Surg 1994;108:899-906. 4. Rodriguez R, Robich MP, Plate JF, Trooskin SZ, Sellke FW. Gastrointestinal Complications following Cardiac Surgery: A Comprehensive Review. J Card Surg 2010;25:188-97. 5. Ohri SK, Desai JB, Gaer JA, Roussak JB, Hashemi M, Smith PL, et al. Intra-abdominal complications after cardiopulmonary bypass. Ann Thorac Surg 1991;52:826-31. 6. Yilmaz AT, Arslan M, Demirkilc U, Ozal E, Kuralay E, Bingol H, et al. Gastrointestinal complications after cardiac surgery. Eur J Cardiothorac Surg 1996;10:763-7. 7. Iriz E, Ereren E, Yuksel O, Kalaycioglu S. Free Intra-Abdominal Hemorrhage after Open-Heart Surgery An Unusual Gastrointestinal Complication. Tex Heart Inst J 2006;33:523-5. 8. Taccone FS, Starc JM, Sculier JP. Splenic spontaneous rupture (SSR) and hemoperitoneum associated with low molecular weight heparin: A case report. Support Care Cancer 2003;11:336-8. 9. Melde SL. Enoxaparin-induced retroperitoneal hematoma. Ann Pharmacother 2003;37:822-4.